“You can’t go for the kill shot. 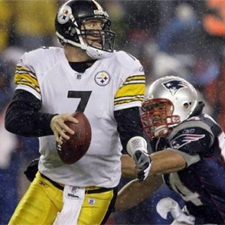 You just got to grab an arm and pull him down.” — Patriots defensive lineman Shaun Ellis on Ben, from the blog below. It’s no secret that one of the reasons that the Pittsburgh Steelers’ Ben Roethlisberger is considered a top-tier quarterback is due to his ability to stretch plays. He isn’t the most accurate passer or as cerebral as Tom Brady, but Roethlisberger may be better than any other quarterback when under siege. He has faced pressure on 35.4 percent of his total drop backs, yet has a 60.4 accuracy percentage – the total number of completions minus dropped passes – in such situations, placing him fourth in the league among quarterbacks who have faced a similar amount of pressure. The difference between Roethlisberger and those that rank above him on that list is that he actually invites pressure due to his ability to escape it, which makes the aforementioned kill shot an effective way for a defense to shoot itself. Often times, he won’t react to the defense at the line of scrimmage like most quarterbacks. Instead, he’ll take the snap and allow the defense to show itself before making a read. No other quarterback, including Philadelphia’s Michael Vick, can operate under such mayhem effectively on a consistent basis. You can read more from Mr. Underhill’s blog here. “Big guy. Strong. Very elusive. Strong arm strength. Can make all the throws. He’s definitely a top quarterback in this league for a reason.” — Patriots safety James Ihedigbo, from the article below. While Aaron Rodgers, Tom Brady and Drew Brees are now the names most often bandied about when debating the relative merits of the best quarterback in the NFL today, the Pittsburgh Steelers’ Ben Roethlisberger brings an imposing physical presence to the position that none of them do. You can read more from Mr. Farley’s column here. 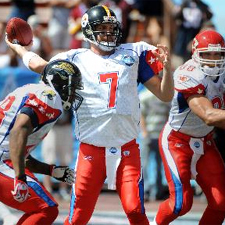 Continue voting for Ben and his teammates for the 2012 Pro Bowl! Ben completed 26 passes for 361 yards and 3 touchdowns in the Steelers 32-20 win over the Arizona Cardinals on Sunday. Voting ends on Friday at 3:00 PM. Ben was nominated in Week 5 after he threw for 228 yards and 5 touchdowns against the Titans, but Packers fans beat out Steelers fans in the voting making Aaron Rodgers the winner with a total of 365 yards and just 2 touchdowns! Come on Steelers fans, we can do better than that! Check out the website’s Facebook page for a few screen caps of Ben’s “Championship belts”, won today in the Steelers locker room for his excellence in shuffleboard! Ben will appear on the DVE Morning Show with Jim and Randy!